I was walking around with no intention of going into a cookie shop. In fact, I had just treated myself to a (pretty mediocre) chocolate chip cookie. But when I spotted a big blue sign, that spelled cookies in lettering so cute it just could not be ignored, I crossed the street and made my way over. And I’m so glad I did. 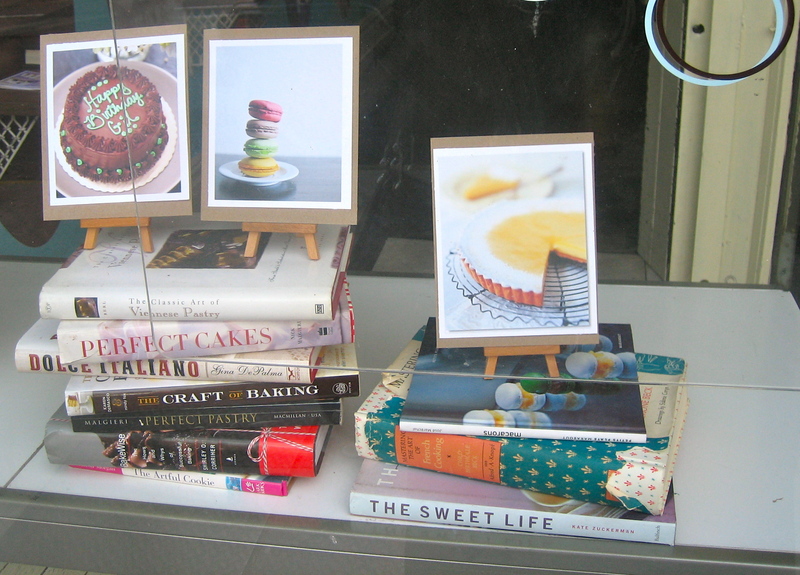 This little bakery is just brimming with cute, from the perfectly disarranged cookbook display in the window, to the vintage family photos inside. The lady behind the counter was super friendly, cheerful, and welcoming. There’s seating at the bar where the pastry display is, as well as a cute little space with tables that would be just the perfect thing for a special afternoon tea with your child or niece. Lacking both, I’m sure a girlfriend would be great too! A little blackboard in the window listed classes like a “Birthday Cake Class for Tweens,” a “Tres Chic French Macaron Class,” and a “Perfect Mom’s Day Citrus Curd Tart Class.” How fun do those sound? And wouldn’t the last one would be such a cool Mother’s Day gift? On to the cookies. I chose four, with the help of this adorable little boy, who I was told has been coming here since the place first opened five years ago. 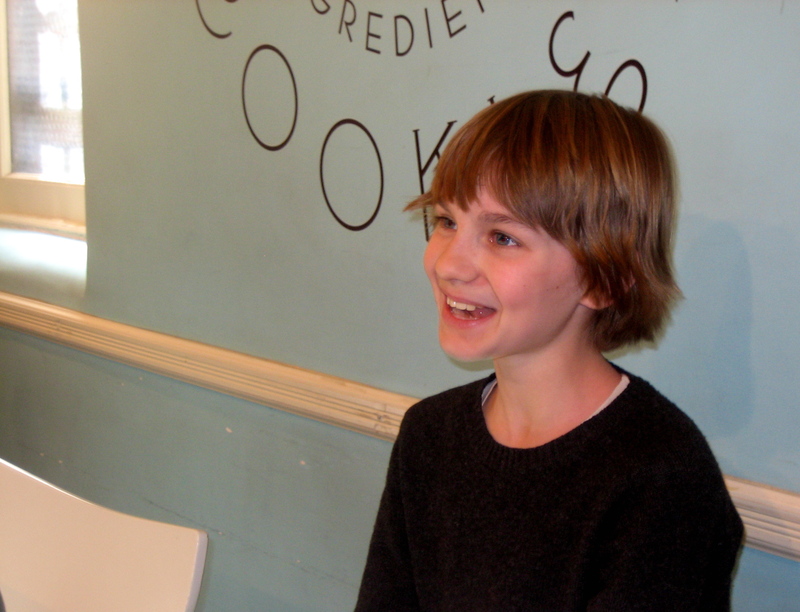 He was sitting up at the bar, chatting with the staff, and knew the names of all of the cookies. He told me that the Lucia, his favorite, was unavailable that day, but added that Cecilia would be his second choice. How cute is he? My cookies carefully wrapped, I made my way home, and waited patiently for my husband to come home to share my treats. I could tell by the level of attention to detail at the store, the wonderful service, and the eager little boy, that these cookies would be special. And they were. Our favorite was the nut bar, which I added at the last minute: the nuts were fresh and yielding under their crisp caramelized exterior. The caramel was heady and complex, and the buttery base was delicious. The Cecilia, which looks perhaps the most unassuming, scored second place with us, the mocha cream sandwiched between two chocolate wafers was surprisingly strong, the coffee flavor perky and bright. The chocolate chip cookie was perfect, crisp with a moist interior and delicious chocolate morsels. 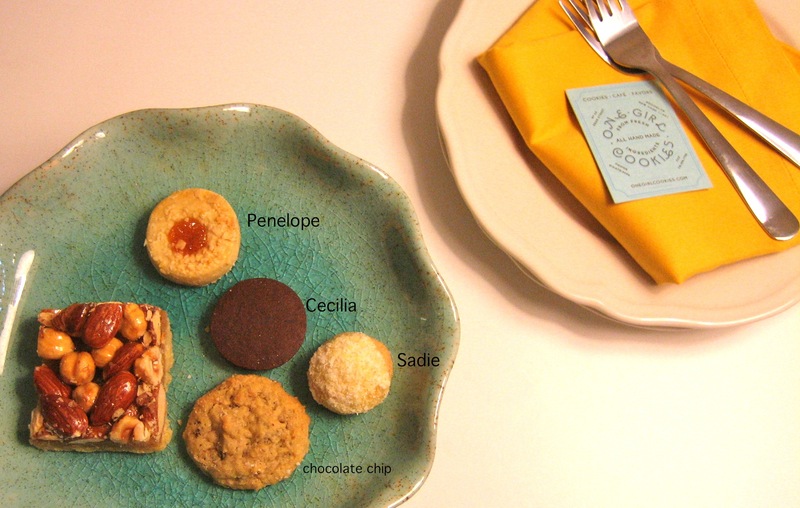 We also enjoyed the Sadie, an orange butter cookie topped with shredded coconut, as well as the Penelope, a flaky butter cookie filled with bright apricot preserves. 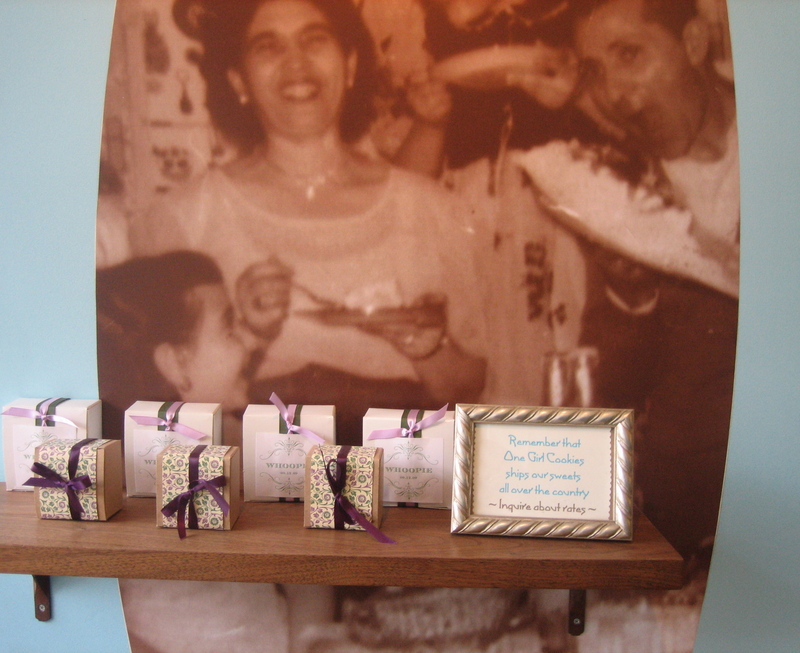 One Girl Cookies also offers a Cookie Bar, which would be such a fun treat at an event! They also do personalized favors and deliver their cookies throughout the US- I think a box of their mini cookies would make an absolutely adorable gift. your descriptions are delightful, the cookies sound wonderful and i as sooo impressed by the willpower to not gobble up the cookies on the spot! thanks debbie! it was really hard to resist breaking into the bags on my subway ride home! Hi Lia! That’s so awesome that you lived right across from them! That would have been way too dangerous for me though! I’ve only been there once, but I’ve been fantasizing about going back ever since ;) That little boy is just too cute! How fun must it be for him to grow up on that block and have his little afternoon snack in their bakery? !